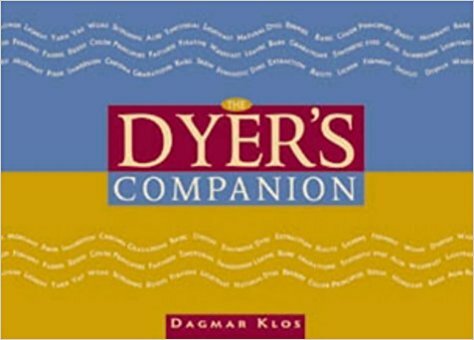 The Dyer's Companion is an essential reference tool for anyone who wants to dye natural or synthetic fibers, fabric or yarns. This handy, easily accessible guide offers a wealth of indispensable information on equipment and supplies, types of dyes, preparation, safety, measurements, dyeing procedures, basic surface design techniques (including painting, marbling, and silk screening), proper dye disposal methods, and recordkeeping. Dye master Dagmar Klos draws on her wealth of experience to provide step-by-step recipes for dye methods she has refined, ones that produce consistent and successful results. Beginners will gain the confidence to add color to fiber, while seasoned textile artisans are sure to discover a host of friendly tips and hints. An eight-page color section showing 100 skeins of yarn in a range of color gradations, along with the fundamentals of color theory, provide you with encouragement to explore your own dyeing variations.